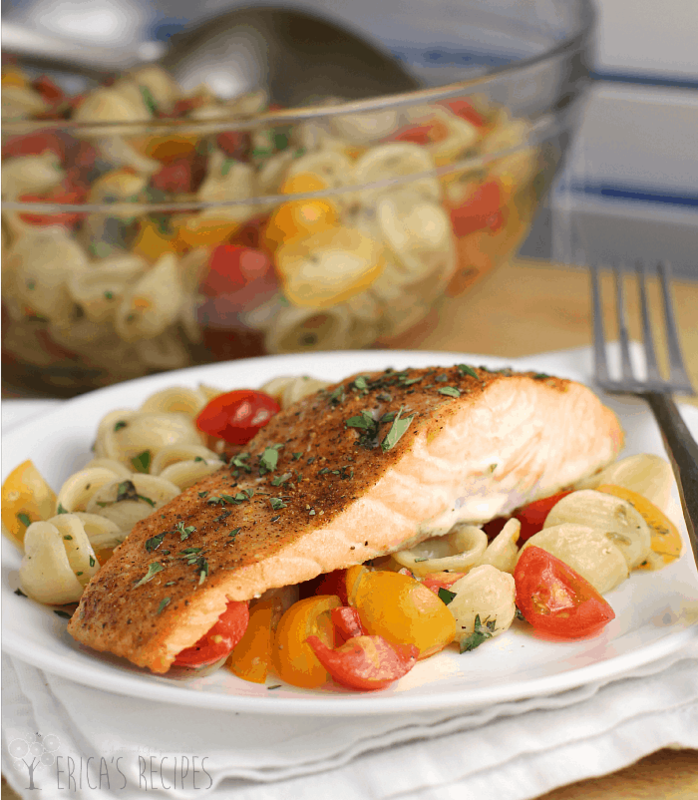 Succulent baked salmon, that is so simple to prepare, served over equally easy orecchiette pasta with a fresh and herbed tomato “sauce”. Health and happiness are what you get with this beautiful spring-inspired Easy Baked Salmon over Orecchiette with Raw Tomato Sauce recipe. But, the tomatoes. The tomatoes in this dinner did not come from my garden (the oregano did though! *she says proudly*). We’re still at the one-or-two-tomatoes-a-week phase. But spring has absolutely arrived here in Florida, it was warm now and tomatoes are on the way. Hence the inspiration for this delicious dinner. Even if I did have to buy the tomatoes. What we have with this dinner is a very easy, wholesome meal, perfect for busy weeknights. 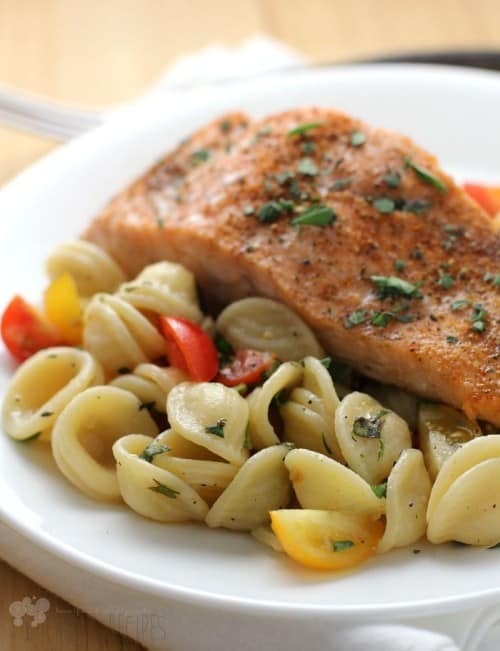 The salmon is simply baked and is ready in the time it takes to cook the pasta. Then the pasta is tossed with lovelies like olive oil, garlic, and the colorful tomatoes. The heat from the pasta warms the oil and tomatoes, but the tomatoes aren’t “cooked”. So awesome and so delicious. So that’s it kids! 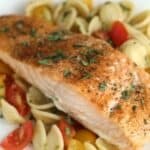 Ready super fast, totally healthy, and just super pretty to look at, this Easy Baked Salmon over Orecchiette with Raw Tomato Sauce dinner is an absolute must try for you and your family. Heat the oven to 400F. Bring a large pot of water to a boil. Lay the salmon on a bake sheet, skin side down, and season with salt, pepper, and Old Bay (I'm pretty generous with the Old Bay). Put the salmon to bake in the oven 8-10 minutes or until it flakes easily with a fork. Meanwhile, add the pasta and a palmful of kosher salt to the boiling water. Cook the pasta to al dente according to package directions. 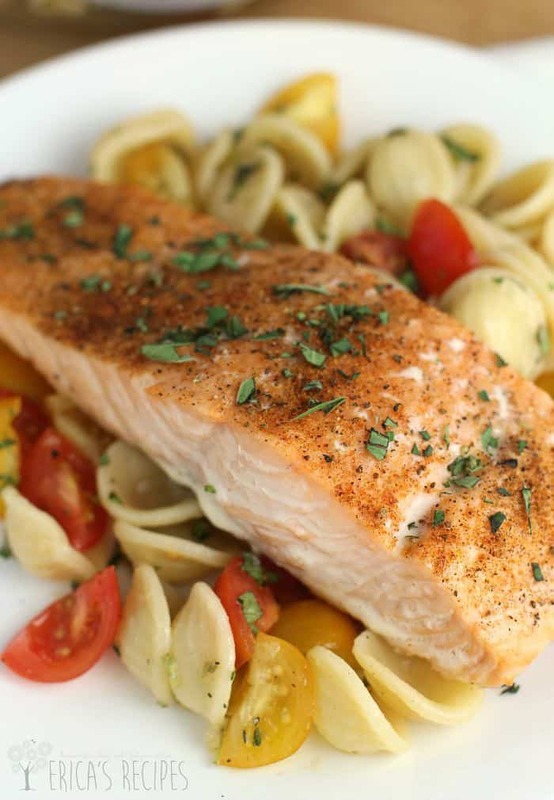 While the salmon and pasta are cooking, add the olive oil, garlic, tomatoes, and oregano to a large boil. Once the pasta is done, drain briefly and add to the raw tomato sauce. Season generously with salt and pepper to taste. To serve, put some of the pasta on a plate. Top with a piece of salmon. Garnish with additional oregano. Yields: 4 servings. Leave me a comment and let me know what you think! Otherwise, I’m just talking to myself here. Got any tomato growing advice for me? Our tomatoes did horribly last year. Hoping for a better outcome this year. Home grown tomatoes would be perfect in this recipe. Love how easy and healthy it is. I absolutely like everything about this dish! We love anything with tomatoes! I love a good Salmon recipe. I cannot wait to try thid. 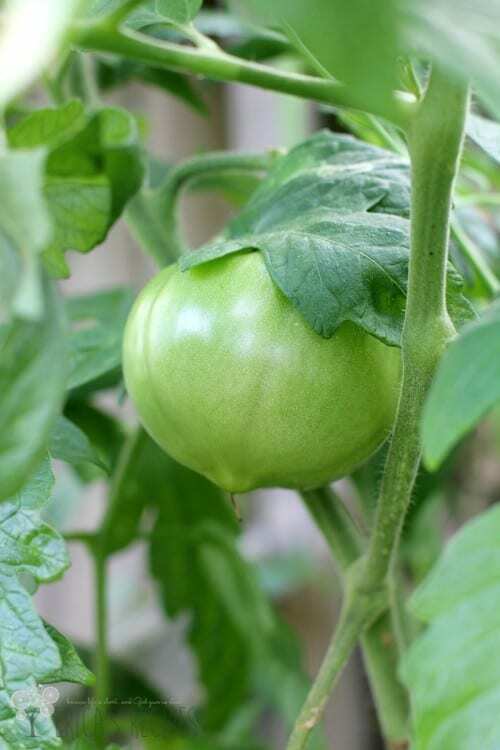 Oh, I am jealous that you are growing garden tomatoes right now! 🙂 We won’t have any around here for a couple of more months.This salmon dish looks amazing! I haven’t had Salmon in so long and this looks amazing. 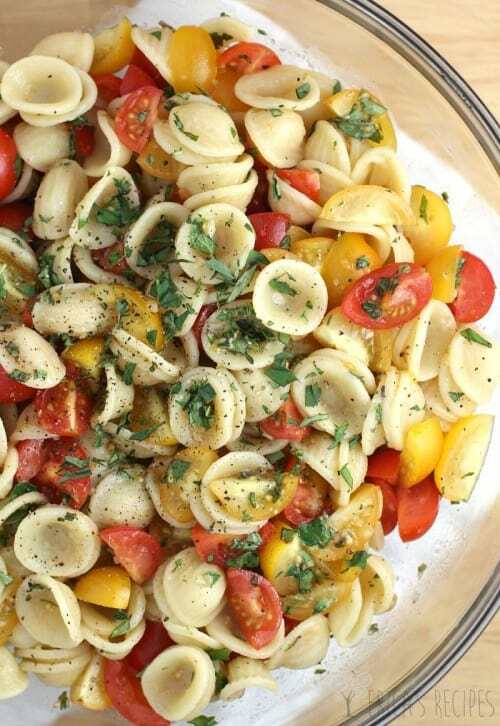 I love the pasta with the tomatoes. I looks incredible. I love salmon, and those tomatoes look delicious!!! This looks so good! I am just not a fan of salmon, but my family loves it, so I make it for them at least every couple of months. I know they would love this! Just a little jealous of your tomatoes. We can’t grow any until at least another six weeks. Our last frost is in May, and tomatoes just don’t like that. I may start a few inside or buy them already well started!! We all love salmon around here and this is a dish my family would enjoy pretty much! I love salmon, this sounds like a wonderful preparation, I can’t wait for fresh tomato season to arrive here in New England! We make salmon with a homemade rub similar to what you have, but usually fix it with mashed potatoes or rice. 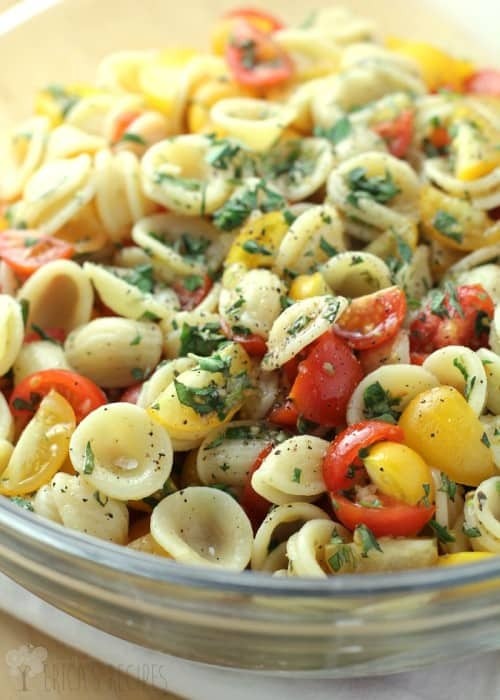 Your pasta looks amazing!!!! Can’t wait to try it!